Visit the Staples clearance section today for great savings on your office essentials. Save on First Aid equipment, desk equipment, stationery, technology such as speakers, projection screens, microphones and much more. With up to 70% off, this clearance sale is fantastic if you're on a budget when shopping for office products. Where do I use my Staples voucher code? Receive a welcome discount when you sign up to the Staples newsletter and get all the latest deals & discounts delivered straight to your inbox. As a leading company in the world of office supplies and stationery, Staples is a well known trusted brand that it’s customer have relied on for decades. Stocking the tools that everyone needs to keep office admin tasks running smoothly as well as at home and school - Staples is the place you can find supplies suitable for the whole family. From photo printers to cash registers and binding machines to even the basics including notepads, folders, and stationery, everything you need and more is awaiting you at Staples. Find quality brands in the world of office supplies featured on the Staples site including the likes of Canon, Hp, Epson and many more all under one roof both online and in-store. If you’re in search of some inspiration when shopping online, why not check out the Knowledge centre for advice from the experts themselves. This features a selection of insightful articles which can help point you in the right direction to making the purchase you can be confident in. Staples can supply everything above and beyond your office supply expectations so when you need to kit out your home office, get the kids ready for school or you’re in search for the latest technology like laptops, digital cameras or smartphone accessories, Staples has got you covered. If you’re a Staples personal customer, you will know that Staples has always got you covered when it comes to your home office needs. Staples can also be the perfect partner for business customers too. Corporate customers are able to enjoy a wide array of excellent benefits with Staples Advantage where customers can work directly with Staples to create a tailored programme which can help identify the core needs of your business. With this, your business is able to enjoy an easier ordering process and better prices which can help boost your business in no time. Don’t spend more than you have to on equipping your home or workspace with the latest supplies and furnishings. When it comes to the essentials, we here at NetVoucherCodes know you would prefer to spend a minimum, it’s for that reason we feature a wide array of money-saving Discount Codes to use at Staples right here on our deals page. Choose an offer of your choice and use it online at the Staples checkout and save a great deal of cash when you’re next buying anything from paper and stationery to printers and computer desks. When it comes to your home office, work or your studies, you can never have too many office supplies and the wide selection at Staples is one of the most comprehensive available online. Shop everything from desks, stationery, paper, storage trays, printer ink, bookshelves and so much more which are guaranteed to help you create a more organised and professional working environment. 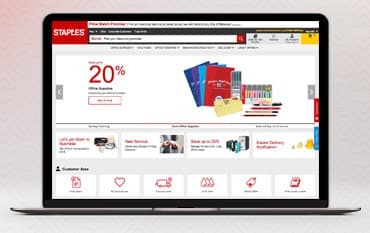 With goods to suit every type of person, shop online at Staples today for less when you add one of our Discount Codes onto your order at the checkout. Uncover Office Supplies and so much more with a brand you can rely on. Whether it’s an Office chair, Desks and Table or Lamps and Lighting, it is often Office furniture which lays the foundations for any good business either at home or corporate. For anyone who spends a long period of time behind a desk, it’s important to ensure you’re equipped with furnishing which offers comfort, efficiency and productivity. The Staples collection of furniture for the office features everything from safes and secure storage items, to desk organisers and display equipment. Enjoy everything from luxurious executive furnishings to more affordable items for your home office all in the Office Furniture section online at Staples. You can return your good for free at Staples and can return goods up to 12-months after they have been purchased. From paper and ink to office furniture, computers and much more, at Staples, you can find all the Office and Stationery items you need all in one place. Head to staples for everything from school supplies to products suitable for businesses both big and small and shop with confidence that you can guarantee excellent quality from this trusty brand. With nothing but quality products built to last and tailored to meet all your office needs, ensure you’re kitted out with the best and most affordable office supplies and shop with one of our Staples Coupon Codes to grab money off when you next shop online.